At Last, A Gift You Can Give With Confidence! We have constructed an elegant, high-quality corkscrew, wine stopper and foil cutter to make the ideal gift for any wine lover, party host, or anyone looking to add to their home/bar. Delivered in our beautiful gift box packaging, we have eliminated the stress of finding and putting together a present for you this Valentine's Day! Don't stress yourself out - give this thoughtful gift that will bring smiles and memorable times this Valentine's Day! Because of Our Special Low Price, Stock Will Not Last Long... Click 'Add to Cart' and Buy Now! 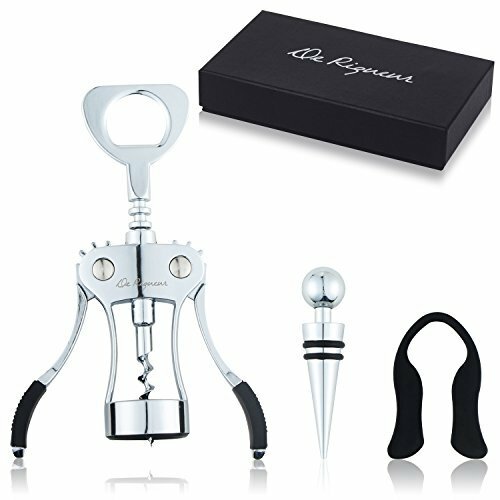 VALENTINE'S DAY GIFT - This corkscrew set, with its elegant wine gift box, is one of the best gift ideas for your girlfriend, boyfriend or anyone special in your life. It is also a great last minute housewarming gift or present for any occasion: no wrapping paper is necessary. FASHIONABLE - A premium wine bottle opener is a must-have barware accessory for every wine drinker, connoisseur, hostess or host. Your friends will be jealous of you with this stylish wine accessories set at your next dinner party, get-together or wherever there is wine. RELIABLE - Chrome plated, solid metal construction that is built to last. You can depend on this wine corkscrew for a lifetime as you feel the quality in your hands. It effortlessly removes all cork types and is a beer bottle opener as well. MOST VALUE - Wine Bottle Stopper to preserve your wine and prevent spillage; Foil Cutter to easily remove stubborn foil with its strong blades; Free E-Book, "Good Wine Guide." Become a Sommelier and impress everyone with everything you will know about wine.